The Iowa Department of Natural Resources, Arkansas Game & Fish Commission, The National Park Service, The U.S. Fish and Wildlife Service and The Trumpeter Swan Society (TTSS) have all teamed up in an effort to expand where restored Midwest Trumpeter Swans winter. One of TTSS' goals has been to encourage southward migration of Trumpeter Swans under the approval of the Mississippi Flyway. The Trumpeter Swan has been successfully established as a breeding species in the Midwest, but limited winter migration has been a major concern. The Iowa DNR recently captured 9-month old free-flying trumpeters from ponds of private Iowa swan propagators who have been partnering with the Iowa DNR to restore the species to Iowa since 1995. The hope is that the young swans will imprint on the Arkansas locations so that they will establish a migratory tradition. The National Park Service's Buffalo River and the Holla Bend National Wildlife Refuge are the sites of releases of the Iowa swans January 23rd & 24th. To read more about the experiment, visit the Illinois' Outdoors News in Prairie State Outdoors. Swans are banded with green collars with white codes (1P0 - 0P0) and the public is asked to keep an eye out for the swans. Trumpeter Swans typically begin moving north to breeding marshes by early March. The Arkansas Game and Fish Commission is looking for reports of these banded swans. 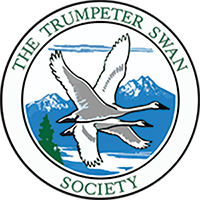 Please click here to go directly to their Trumpeter Swan Survey web page. February 17, 2009: release of more swans in Arkansas to encourage migration - Fifteen more Trumpeter Swans from Iowa were released the week of February 16th at Holla Bend National Wildlife Refuge and Boxley Valley Mill Pond in Newton County, Arkansas. The hope is that these swans will fly north in the spring and develop a wintering tradition in Arkansas. Please report any banded swans that you observe.